Equiptec is a global supplier of heavy-duty height-adjustable maintenance platforms that utilise a unique, patented, vertical rise system (VRS – Vertical Rise Stairs), along with other cutting-edge access products for a wide range of industries, including mining, heavy transport, construction and aviation. The vertical aspect of these units gives exceptional versatility, allowing many options to be added, but also very importantly retaining the same Cantilever reach in all positions. This allows you to achieve the same reach over obstacles at all platform heights, even as low as 1.2m. The company’s solutions combine resilient and innovative designs, along with high-quality manufacturing standards. Equiptec’s VRS Giraffe series of height-adjustable stairs are the biggest of the VRS ranges. They are very robust (WLL of 250kg) and a reliable tool to enhance staff safety while optimising ergonomics, and efficiency. The Giraffe features include a long, strong cantilevered deck, hands-free access with wide easy-climb constant grade stairs, and multiple deck gates allowing access off both the sides and the end of the Platform so that the Giraffe can function as both a work platform and a multi-access stairway. The Giraffe is also easy to move and transport with forklift pockets under the chassis, plus with all-wheel steering and 200mm braked castors manual manoeuvring on the Workshop floor is a breeze. And then if you need to access on-site machinery away from the workshop, there is the VRS Giraffe Trailer option. Just load it on, drive to site and back up to your project. The VRS Monkey Series utilises steps instead of stairs, making it a compact version of the Giraffe, and suitable for factories, and smaller workshops. However, with an optional package it can also be used in rough terrain applications. The easily moved Monkey features a height-adjustable, cantilevered deck with a working load limit of 225kg, multiple height settings, and a front gate for walkthrough access. Side gates can be provided as an option also. Single axel wheels and drop-down handles ensure high-manoeuvrability, the spring assisted lift allows for easy and very rapid height adjustments (6 heights in 6 seconds), and the constant grade steps along with tough, ultra grippy-treads make it so safe for end-users to climb. Similar to the Giraffe, the Monkey has an easy loading Trailer option for on-site applications. The VRS Squirrel Series brings the safety and efficiency of the VRS platform adjustability to confined spaces. One Squirrel Platform can accommodate four deck heights from 740mm to 1,440mm, which gives you working heights from 1.6m to as much as 3.5m. Its aluminium structure ensures a strong yet lightweight design with integral carry handles, so it is easy to move. And you can lift, shift and adjust the height all from one position. The VRS Go-Base is an option that can be added to either the VRS Monkey, or Squirrel platforms. It allows the Platforms to be mounted on four castors for excellent manoeuvrability in all directions. It also includes an effective and easy-to-use four-wheel braking system, which is somewhat ‘fail-proof’ as it activates instantly, and very positively when a person stands on the bottom step. A simple ‘flip-up’ of the same bottom step releases all four brakes at once to allow the unit to move again. And it’s still all done from the same position. Established in 1994 and based in Napier, New Zealand, Equiptec is a family-owned business that specialises in height access solutions. With clients throughout the world (New Zealand, Laos, Botswana, Kazakhstan, distributers in Australia, New Caledonia, and Canada plus further countries looking to come on board in the near future), the company is experiencing strong global growth in demand for the VRS product range. 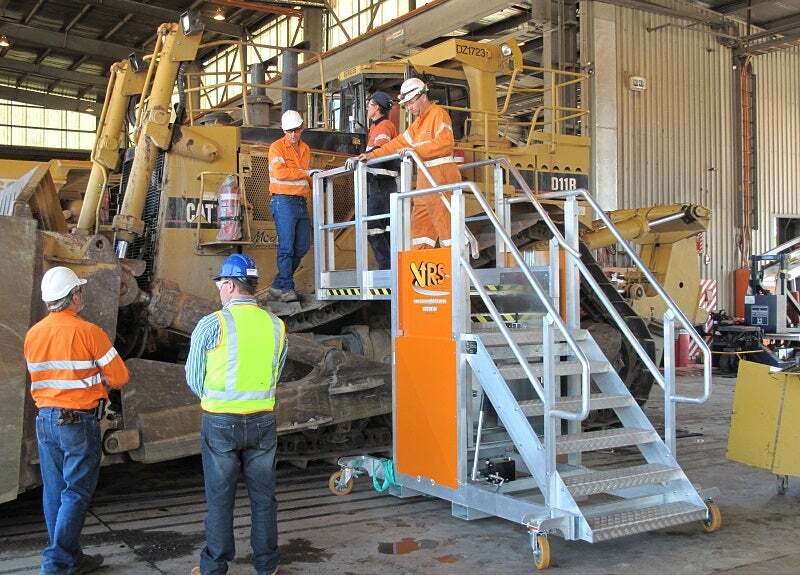 Whether you’re in the business of aircraft maintenance, or forklifts and crawler cranes, or need to access numerous points on machinery such as windscreens, hydraulics, and pins, the VRS Giraffe series does it all – manoeuvring into different machines, providing a constant grade stair access and a wide, flat deck. Keep your staff safe, and more efficient with the Giraffe's wide, easy, constant gradient stairs. The VRS Squirrel Series brings the safety and efficiency of the VRS platform adjustability right down to the office, home, apartment building or any other relatively confined space. The VRS Monkey Series provides a lot of the benefits of the Giraffe, but utilising steps instead of stairs. The new VRS Leopard series is a hybrid of the Monkey and Giraffe series, featuring the small footprint of a Monkey and a great cantilever platform of a Giraffe. Equiptec’s VRS range of platforms has now arrived in Canada. Stepping up to the challenge of providing efficient and reliable access at greater heights, Equiptec’s VRS Giraffe 3409 has hit the runway. Not all job sites are created equal – nor all surfaces. Whether you work in construction, engineering, quarrying or mining industries, accessing all machinery – up, over and on to – is essential, so enlisting the right equipment to get you there is a top priority. Citing the requests and needs of customers across the construction, engineering and mining sectors, Equiptec’s latest VRS Leopard range is breaking new ground. Equiptec’s trusted multi-use platforms – the VRS Monkey and Squirrel – have the capabilities to perform at a huge variety of sites with differing height requirements across all industries.